"I never thought I would see the day when a book would rival the Internet as a source of customized, up-to-date information on a technical topic. The day has come." "Stephen and Patrick have done a wonderful job with Happy About PayPal Website Payments, sharing their wisdom about the most common problems people run into. This book is a must for anyone who wants to ensure they get every penny they are due." 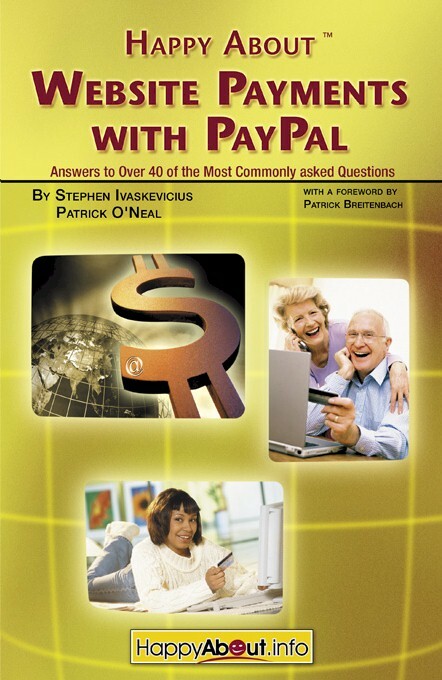 "This is a great book for PayPal merchants and developers. Easy-to-read and full of tips and techniques that can be applied immediately. As a PayPal merchant that doesn't generate much revenue with PayPal today, I learned a lot from this book. I expect to be able to dramatically increase the revenue I produce." "Smart companies take great effort to nurture and sustain a vital developer community. This book pays tribute to the PayPal developer community by capturing the essentials required for a new developer (or merchant) to participate productively in the community and allows them to leverage the wisdom of those who have come before." "This book is an invaluable asset! It provides clear, concise answers to the most common issues that a PayPal developer/merchant faces. Stephen and Patrick are the two most knowledgeable PayPal developers out there; they are the biggest contributors in the community and have closer relationships with the developers than any other advocates of the PayPal system." Stephen Ivaskevicius (AKA PayPalStephen) is currently in Developer Technical Support. This includes support of PayPals APIs, Developer Central, Developer Network, PayPalTech.com and all features used in Merchant Tools. He is an ordained minister, motorcyclist and Parrothead. He graduated from Wayne State College in Wayne, NE in 1996 with a B.S. in Criminal Justice and Psychology. He worked in Corrections and Juvenile Services from 1996 until January 2001 when he started at PayPal (X.com). Stephen also maintains OasisBay.com, designing and developing websites at night and on weekends. Patrick ONeal (AKA PayPal_PatrickO) is a member of PayPals Developer Technical Support Team tasked with supporting PayPal Web Services and Developer Central. Before joining the Developer Technical Support team, Patrick was Senior Agent in PayPal Technical Support and worked primarily with supporting PayPals Merchant Features (e.g., web site payment buttons, IPN, and PDT). Patrick holds an Associates degree in Computer Network Systems and a Bachelor of Science degree in Computer Science with an emphasis on Web Programming. In his free time, Patrick enjoys learning new programming languages, spending time with his 3 children and gaming on the Xbox.